Sabriye Tenberken wants to "kantharize the world." 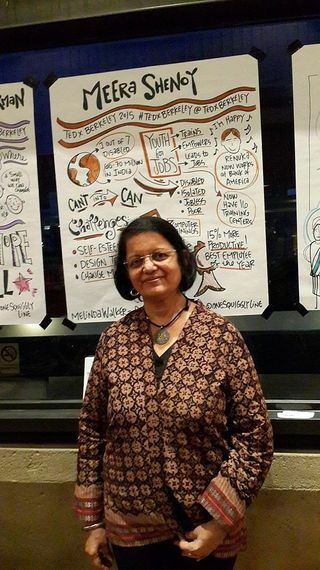 Just like the wild chili plant in India, Kanthari, that has a "fiery taste that makes you sit up and take notice when you bit in it...yet also has medicinal properties," she is dedicated to sparking the interest of disabled or otherwise marginalized individuals (who are usually ignored or worse) to become able change makers. To do so, she co-founded Kanthari, a center with an experiential learning curriculum for them. Training at the center is restricted to "just" five much-needed and practical skills for would-be change makers: business modeling, dealing with government, raising fund, public speaking and working with the media. At Kanthari, to boost the chances that participants will gain purposeful work when done, each one is connected to potential donor agencies so they are equipped to work, in their home country, on a project when they graduate. One graduate runs a mobile library for prisoners in Thailand. A blind student cares for bees in Uganda, selling their honey in Italy. Now that you have seen what she has accomplished, here is Sabrye Tenberken's astounding backstory. She's blind, with a sighted business partner Paul Kronenberg. Prior to co-founding this center she rode, solo, on horseback through Tibet and became moved to set up a school for the blind. Currently she takes daily swims, defying many disabled stereotypes, thus modeling the behavior she seeks to instill in the students who have felt the stings of rejection. 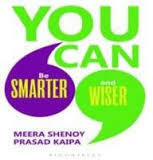 Read 38 other audacious, fascinating stories of "disabled" individuals who have created resourceful organizations, against all odds that opened opportunities for marginalized individuals You Can Be Smarter And Wiser by Meera Shenoy and Prasad Kaipa. 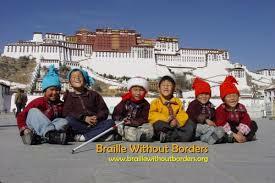 Braille Without Borders is the name of the Tibetan school Sabrye co-founded to teach blind children skills, including vending and weaving, so they could be financially independent. 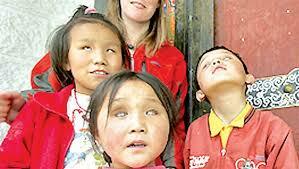 This is transformative, expanding perception "borders" for the blind and the people around them, as Shenoy and Kaipa point out: "Tibetans believe in karma, that blindness is punishment for wrongs in a past life. Sabrye discovered children kept in dark rooms, tied to a bed, thus they couldn't even walk. • In school where peers and teachers did not know how to "deal with a disabled boy" he discovered he "excelled in mathematics, calculating in his head rather than on paper. • He was the most well-read kid in school as he was excluded from most school activities, and ranked highly in several academic standards so "he began to be recognized as a nerd, rather than a disabled boy", writes Meera Shenoy, also founder of Youth4Jobs. • In college he continued to migrate from shunned outsider to valued advocate. He joined forces with the "Enabling Committee" of disabled students to advocate for wheel chair ramps and for JAWS software for the visually impaired. 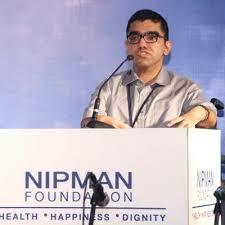 • Next, via the Nipman Foundation he started, Nipun continued to attract allies. Together, they to pressed government agencies to make voting, railways and others vital systems easier for the variously disabled to use. Like Nipun, wheelchair-bound, short, polio-affected Nirmal Kumar turned one of his major impediments into an opportunity to start a business that served others who also had trouble with conventional transportation. After being over-charged for an autowallah (cab) ride, and other unfair or unsafe transportation experiences, he founded G-Auto to provide "friendly and reliable auto service." Key to his success was a no haggling rule, and enabling his drivers to have incentives like medial insurance. Also he supported his drivers in further service differentiation: providing newspapers, magazines, water, mobile chargers - and a number that customers can call in complaints. And he keeps evolving the value his drivers can offer. Hint: mutuality matters. Nirmal told Meeru "My aim is to keep all stakeholders happy." His success has attracted stiff competition from multinational Uber, which is emulating his G-Auto business model, dubbed Uberauto. Yet, because of Nipon's smart and wise approach to serving all stakeholders better and better over time -- not less, and less - which firm do you believe might ultimately win in India?